Wu Long from Playtech is all about celebration – Chinese style. The game’s icons are inspired by classic symbols of partying out East. These include lanterns, fans, fireworks, and of course brightly coloured, celebratory dragons. They’ve been nicely designed, and the bright colours, and traditional music make for a pleasing gameplay experience. 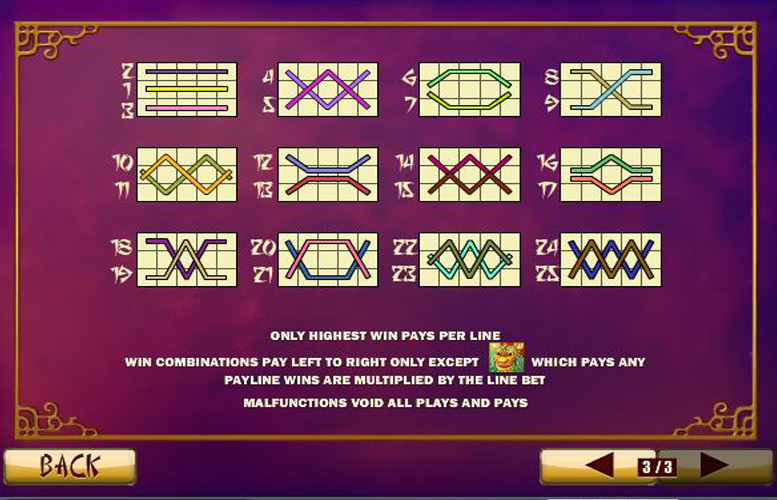 In terms of the actual gaming specifics of this title, it’s a five reel, three row slot with 25 potential win lines that can be activated at once. Wu Long lacks diversity within its features but its single gameplay bonus is potentially a massive one. Wins can rapidly add up thanks the possibility of recurring free games with increasing multipliers. Potentially a very lucrative bonus stage. The free spin game has a huge multiplier as well as the opportunity to win additional free spins. Wu Long is great for the highest rollers. The upper betting limit of £2,500 per spin is ideal for those with the largest bankrolls. Limited bonus features. There’s only one, and it is great but the lack of diversity limits the potential replay value of the title. Chinese arches = 2,500x the line bet. Ladies with fans = 500x the line bet. Instruments = 300x the line bet. Fireworks, or lanterns = 150x the line bet. As mentioned, there’s only one gameplay feature on Wu Long. Fortunately, it is a cracker. Hitting three or more of the Dragon “scatter” symbols anywhere in the main game will win players 12 free games. When the mode starts, additional Dragon “scatters” will trigger one of two events: Growing multipliers, or re-triggering free games. Free games start with a multiplier of 1x. This applies to the current spin, and the multiplier goes down -1 step for every spin that doesn’t have a Dragon on the reels. One dragon = multiplier grows from 1x to 2x, to 4x, to 6x. Two dragons = multiplier grows from 1x to 4x, from x2 and 4x to 6x. 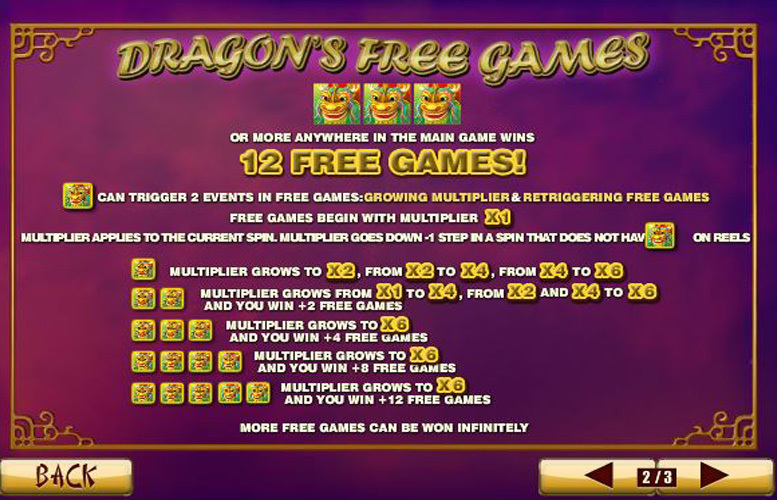 Three dragons = multiplier grows to 6x and players are awarded an additional four free games. Four dragons = multiplier grows to 6x, and you win +8 free games. Five dragons = multiplier grows to 6x and players win +12 free games. Additional games can also be won infinitely. 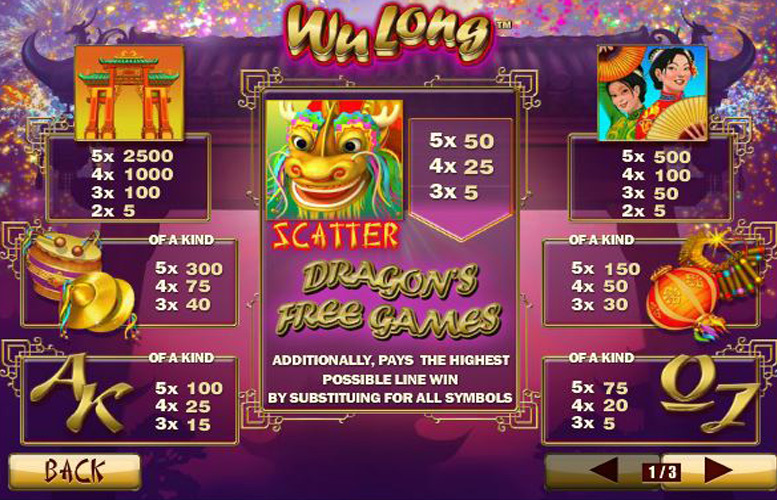 Players can adjust the number of win lines they play on the Wu Long slot machine. The minimum is just one and the maximum 25. They are also able to alter how much they bet on each of these lines. The lowest bet per line is just 1p, and the highest is £100. Using both variables on their minimums, the smallest possible bet per spin is just 1p, and with all values maxed out, the highest is an impressive £2,500. 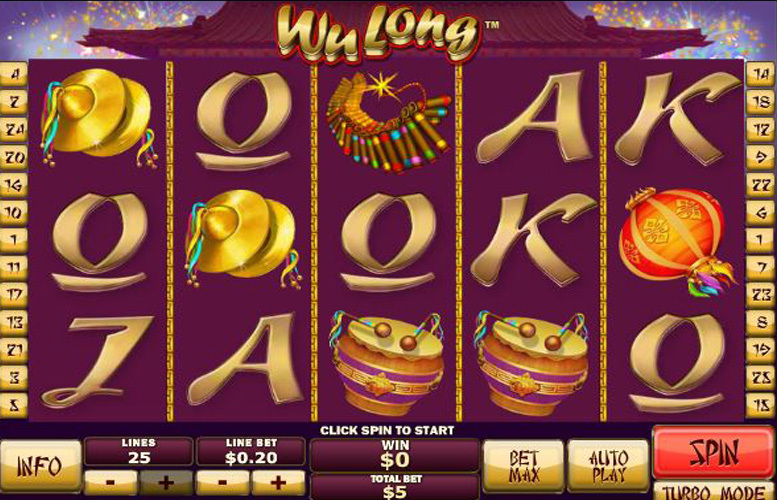 This makes Wu Long the perfect choice for those with enormous bankrolls to take a flutter on. The Wu Long slot machine from Playtech is a bit of a mixed bag, and it’s easy to see how some players wouldn’t enjoy it, whilst others would love it. All the action focuses around the single gameplay feature – a free spin mode that awards additional prizes throughout. Whilst this is a potentially lucrative round, it’s understandable that some would find the lack of diversity limiting. One group that Wu Long really should appeal to is those who like to place huge wagers per spin. It features an enormous £2,500 per spin which is one of the largest we’ve come across. This game has a rating of 4 / 5 with 697 total reviews by the users.